The 4two cup started in 2011, with the aim of giving good close racing to the gentleman driver without breaking the bank. After the first few races it became apparent that the short wheel based car was quite a tricky car to drive fast and all the young drivers that had come from a kart background soon became very quick in the smart. Battles were taking place from front to back. 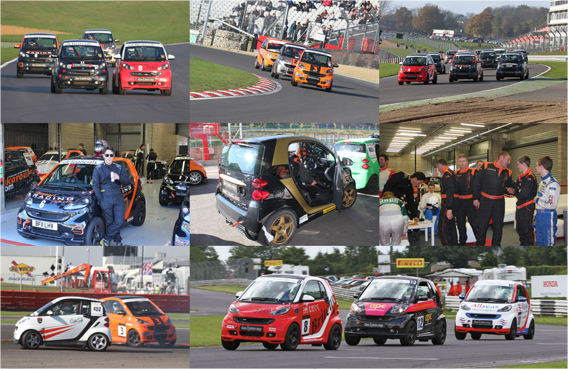 As the BRABUS model smart had never raced before anywhere in the world it proved a challenging year. But with improvements made throughout and by our final round at Brands Hatch the little cars were quick and great fun to drive, with the quickest drivers getting in the 60’s. One of the highlights of last season was taking seven of the cars over to Spa Francorchamps and join the Belgium race series. With 21 cars starting all three races, the racing was exceptionally close with the lead swapping several times per lap. David ‘nipper’ Moore from Tockwith motorsport (pictured right) ended up winning the most races last season, but he did not have it all his own way as in the last but one race of the season his older sister Sarah Moore took a race win and the last race of the season was won by Jake Jackson.